Amanda Brewster is thrilled to be a part of the historic firsts by the CRC women’s team this season. The women’s CRC team got their first CRC grand prix team win (at Rhody 5k) and were second as a team at Mt Washington (best team finish ever?). While the CRC women’s team results are impressive, Amanda’s individual results this season are equally as noteworthy. Back in March Amanda had a half-marathon PR at the New Bedford Half, and also won her first really long distance race (Stu’s 30k). 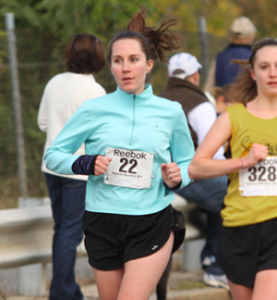 During the summer she managed to get the meet record for the women’s mile at this year’s Somerville marathon relay. 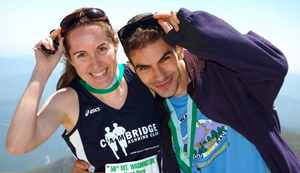 For this accomplishment, she gives much credit to Joe Shapiro who jumped in to cover when she missed her start, giving Amanda a chance to regroup, run the next leg, and reach this new milestone. Amanda’s successes this season in the USATF-NE race series now place her at the top of the standings. Although she will not be running the final event in this series, she is still assured a first place finish (or potentially a tie-for-first place finish) in the USATF-NE women’s open division. What is your preferred racing distance? My favorite distance to race is the 5 mile to 10k range. But I can get that in a longer race too — I just don’t race until the last 5 or 6 miles. What is your favorite New England race? Mt. Washington. I don’t like running up the mountain all that much, but ending on top is really amazing. Repeat 400s on the track — they’re fast, and easy to remember. What are your preferred racing/training shoes? For trainers I’m very loyal to Brooks Adrenaline. I’m on around my 25th pair. I’ve always felt grateful to Brooks for keeping me uninjured, but now that I’ve added it up, I hope they’re grateful to me for buying so many of their shoes! For racing shorter distances I’ve just started wearing Brooks Green Silence. Congratulations Amanda and happy running next season! If you know of a CRC member we can highlight for a great race or effort, nominate them for the Run Down Spotlight by sending an email to the communications committee.